JULY 2018 INDIE NEXT PICK! SUMMER 2018 PUBLISHERS WEEKLY PICK! One afternoon, as Wen catches grasshoppers in the front yard, a stranger unexpectedly appears in the driveway. Leonard is the largest man Wen has ever seen but he is young, friendly, and he wins her over almost instantly. Leonard and Wen talk and play until Leonard abruptly apologizes and tells Wen, "None of what’s going to happen is your fault". Three more strangers then arrive at the cabin carrying unidentifiable, menacing objects. As Wen sprints inside to warn her parents, Leonard calls out: "Your dads won’t want to let us in, Wen. But they have to. We need your help to save the world." Thus begins an unbearably tense, gripping tale of paranoia, sacrifice, apocalypse, and survival that escalates to a shattering conclusion, one in which the fate of a loving family and quite possibly all of humanity are entwined. The Cabin at the End of the World is a masterpiece of terror and suspense from the fantastically fertile imagination of Paul Tremblay. Paul Tremblay has won the Bram Stoker, British Fantasy, and Massachusetts Book awards and is the author of The Cabin at the End of the World, Disappearance at Devil’s Rock, A Head Full of Ghosts, and the crime novels The Little Sleep and No Sleep Till Wonderland. He is currently a member of the board of directors of the Shirley Jackson Awards, and his essays and short fiction have appeared in the Los Angeles Times, Entertainment Weekly online, and numerous year’s-best anthologies. He has a master’s degree in mathematics and lives outside Boston with his family. 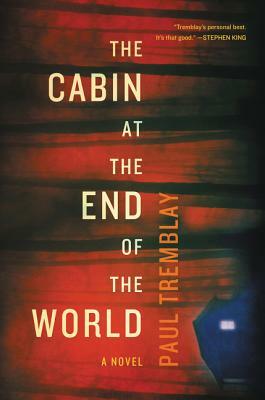 “Paul Tremblay loads emotion and tension into every paragraph on every page of The Cabin at the End of the World. It is a dream come true, a heartfelt, emotionally charged journey into our worst nightmares.